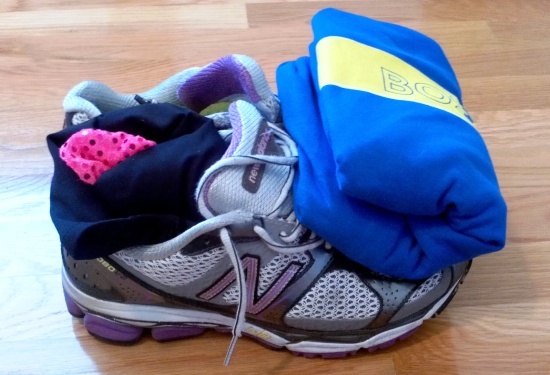 Running While Traveling: Minimalist Packing | Eat. Blog. Run. Traveling can take a toll on your body; there are the long periods of sitting, the junk food options, the general disruption of your daily rhythm. All the more reason to embrace exercise while traveling! However, if you’re like me, and like to pack really, really light, you may choose to ditch your workout gear to save space. This certainly was the case when I went to Dallas last month for BlissDom. 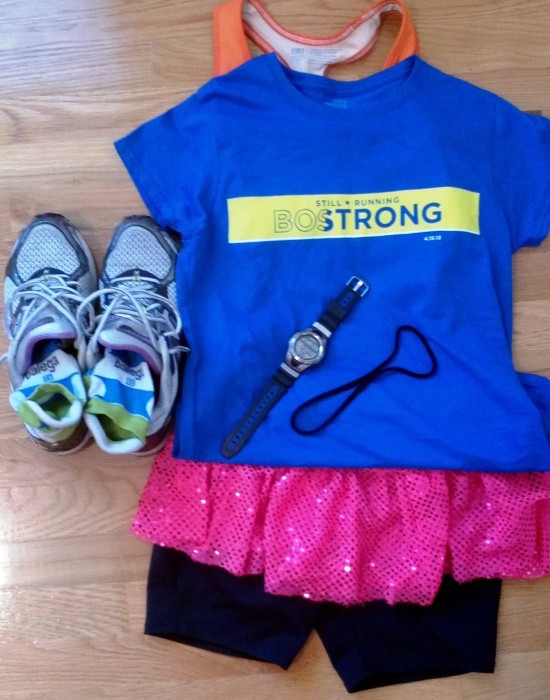 Note that I felt totally lame when my roomie and EBR co-pilot Heather busted out her running gear and asked me to go for a run and I was like, Er, I’m sorry, I packed a lot of extra statement jewelry instead. Anyway, no excuses! Tomorrow I ship out for Mom 2.0 and Marie, Heather, and I are joyfully reuniting for Run 2.0 with MinuteClinic. So today, I wanted to share my minimalist packing strategy for the trip. So I’ll have plenty of room in my carry-on to accommodate my running gear and my statement jewelry. Roll the skirt and shorts into a tiny roll and stuff it in one shoe. Stuff socks, stopwatch, and headband in the other shoe. There will be a little extra room if you want to stuff a SpiBelt or something like that in there. Lay tank and tee flat and fold them together (this is key for saving space). Package them on top of the shoes. And there you have it! You can be completely outfitted for a spring/summer run in the general space footprint of your shoes! Great post! I’m running the Minute Clinic 2.0 tomorrow too (my first official 5K ever) and am driving down for the day, so packing light is essential. Also, I’m from Boston and LOVE the shirt. We’re running in LA for Boston, too! Christine, I love your strategy. Another big advantage of keeping it all together is making it so easy to roll out the door at 6:22 even if roommates are still sleeping.